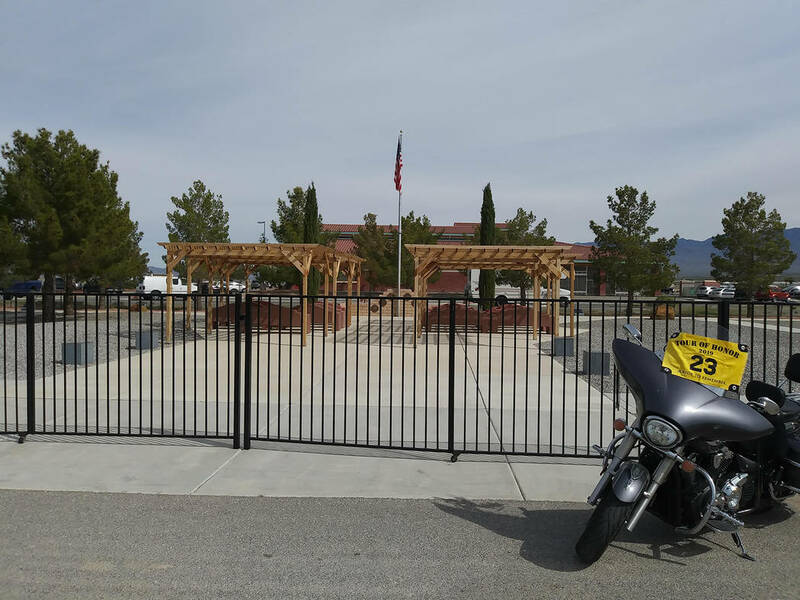 The town of Pahrump is readying to see an increase in motorcyclists traveling through the area and stopping at the Chief Tecopa Cemetery, all as part of a nationwide initiative titled the Tour of Honor. Special to the Pahrump Valley Times Also included in the 2019 Tour of Honor is the American Legion Post #8 in Downton Las Vegas. 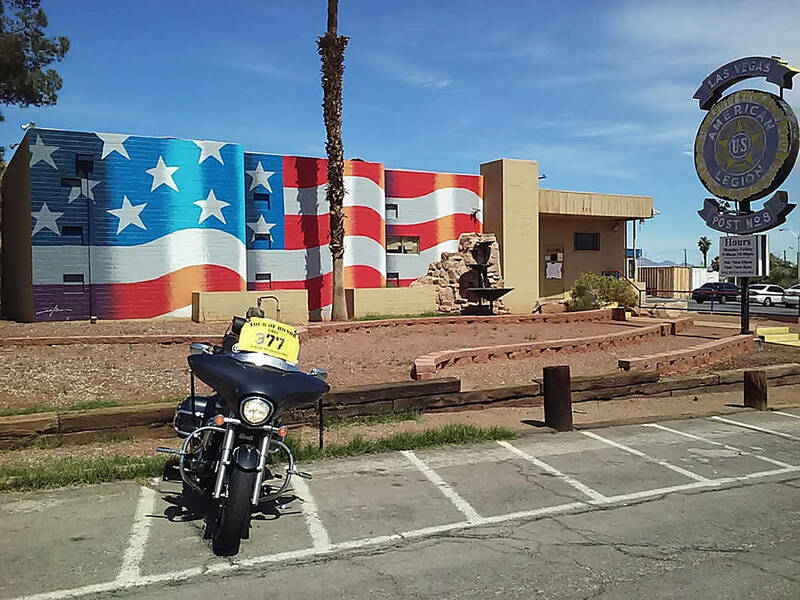 Special to the Pahrump Valley Times Provided by Matthew McAtee of the Tour of Honor, this photo shows a motorcycle parked in front of the Pahrump Veterans Memorial, one of seven Nevada sites selected to be part of this year's tour. 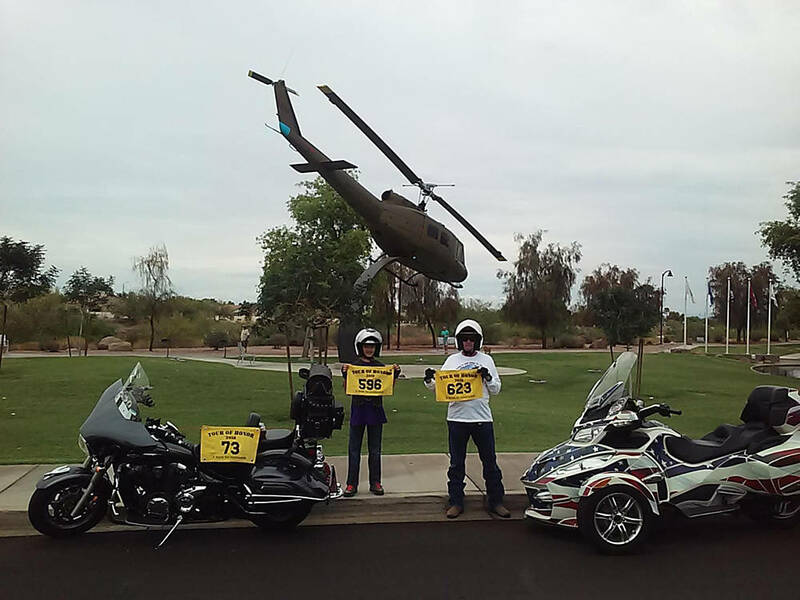 Special to the Pahrump Valley Times Matthew McAtee of the Tour of Honor snapped this photo of his fellow riders, his father Gale McAtee and nephew Hunter Miller, during a previous year's stop at the city of Peoria's Veterans Memorial in Arizona. “We have an awesome opportunity to publicize the Veterans Memorial at the Pahrump Chief Tecopa Cemetery,” area veteran Dr. Tom Waters announced with obvious excitement. The Veterans Memorial has been selected as one of the seven sites in Nevada to be included in the Tour of Honor for 2019. “Beginning in April and going through October 31, 2019, Tour of Honor riders will visit Pahrump. Even though the program actually began on April 1, we are using April 15 as our ‘start date’ to allow ourselves time to acquire banners, etc. for the riders as they come through,” Waters detailed. Matthew McAtee, Tour of Honor liaison for the state of Nevada, expanded on the tour, explaining that the annual event typically includes more than 800 motorcycle riders who travel the United States visiting the selected memorials, with money from the registration fees going toward three different charities, Fisher House Foundation, Operation Comfort Warriors, and Police and Fire: The Fallen Heroes. McAtee noted that cities and towns included in the tour generally get into the spirit of the occasion and there have been many creative ideas spawned from the desire to show appreciation and support for the Tour of Honor. The town’s tourism department is already gathering ideas for ways to make Pahrump a particularly special and memorable stop along the tour but the community’s help is necessary to make that happen. There are already preparations for a welcome banner to be placed at the Veterans Memorial for the riders to take photos with, as proof of their visit, and the town’s tourism office will be the official “sign-in” point for riders to record details such as their names, where they are from and how many miles they have traveled. All riders will also receive a small plaque and promotional gift from the Pahrump tourism department as a show of gratitude for their inclusion of the valley in the Tour of Honor. Waters said these items are being funded through donations and it’s hoped that enough generosity is shown through contributions that all costs will be covered. However, any remaining costs after donations would likely then be taken to the county for a request of funds from the Nye County Veterans Services fund. As for additional methods of ensuring a warm welcome for the riders, Pahrump Tourism Executive Assistant Alex Crow explained that the town needs local support. “Other ideas were brought up but we need help from businesses,” she said, throwing out several possibilities, such as local hotels providing discounts for riders, free coffee for riders taking part in the tour or discounts at local eateries.